SNES Donkey Kong Country 3: Dixie Kong's Double Trouble! (USA) in 44:40.63 by Dooty. A TAS of the most beautiful Donkey Kong Country game on the SNES. 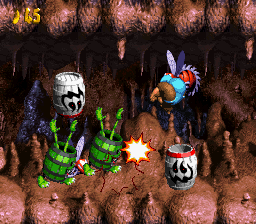 This run uses warp barrels. It also improves the previous run by 28.26 seconds by using new tricks, such as delayed jumps and backward flights, and abusing hitboxes even further. Please read the author's comments for details about the new tricks. For more primate action, we recommend watching the 105% completion movie.